OUR LATEST PACK OF REUSABLE SLIDING SEALS, are proving a great hit with everyone. Each Multi Pack of Magic Lock now has 10 sealers in 4 different sizes to fit all your packaging needs. You get 2 orange sealers for your kilo bags of frozen foods, your large wraps and large bags of supermarket salads, three red sealers for your half kilo bags of frozen food, your crisps and biscuits, three blue sealers for your coffee, milo, baking ingredients etc. etc. and two green sealers for your packets of nuts, pasta, cake decorations etc. etc. 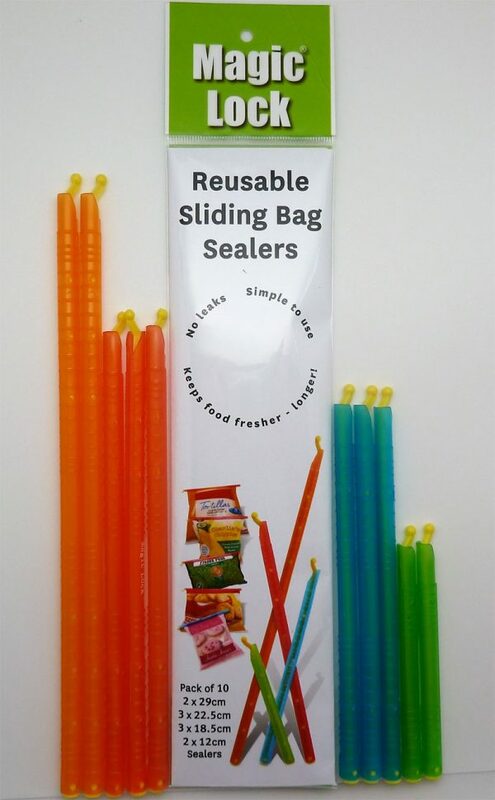 Our Freezer Friendly Magic Lock bag sealers are so simple to use, you just fold the bag and slide it across to get that 100% seal. 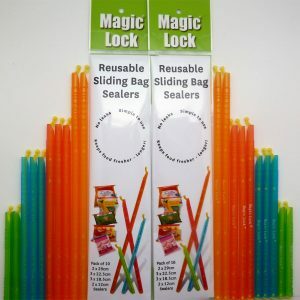 Use them in the freezer the pantry, the storage locker, there are a 1000 uses for Magic Lock. Dont take our word as to how good they are, go to testimonials and read what others have to say about Magic Lock. FOR DELIVERIES TO AMERICA OR THE UK YOU WILL BE CHARGED THE DELIVERY SURCHARGE.